The transmission of danced legacies and the identification of their evolutionary presence in contemporary venues are the primary underpinnings of my artistic work. The physical articulation of cultural beliefs is the space from which I continue to research, choreograph, and perform in order to contribute to creating deeper expressions of the living art of African dance forms and their connection to personal/group identity. My research continues to examine how African and African-derived dance unfolds its many identities. Dance is an expression of perseverance and is a creative continuation of cultural mores. As a symbol of survival, dance both embodies and transmits traditions. These time honored, well established dances provide a means for present day access to, and direct experience with earlier traditions which oftentimes only exist in the context of dance related rituals. 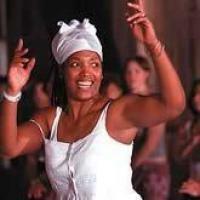 The unfolding identity of dance creates a framework for analyzing the aesthetic, technical, ceremonial, spiritual, and sacred tenets that layer traditional African and African-derived dance forms. This concept provides the foundation for several of my completed projects and it continues to shape the thematic content of present works. I coined the term “dance translator” to address my process of examining my personal voice in dance. Using my body as text, I am able to communicate an existing legacy of danced religious, spiritual, and cultural beliefs. Dances of the African Diaspora, Dance Ritual, Dance and Healing, and Choreography, African Dance as Intangible Cultural Heritage. "Reaching Into the Before Time" , (Collaboration with Cici Stevens. Our goal to take dance and sculpture out of the traditional venues and create a site-specific performance event at an historic site led us to explore places rich in history. The eventual creation of the active installation will examine how physical structures function for individuals in contemporary times and how people make use of ancient rituals to continue cultural practices and preserve a spiritual way of being. The active installation is envisioned as a kinesthetic and multi-sensory approach to looking at historical events"The Burning Fields" (Day to day acts of resistance by enslaved women during the Atlantic Slave Trade), , "Crossing the Color of the Sky" (The use of bottle trees in the American South), , "Unity NC African Arts Conference" (Co-director May 21-23, 2010 Mainstage concert May 22, 2010 Reynolds Theater), "Across the Threshold: Creativity, Being, & Healing" is an interdisciplinary conference (2009)/symposium (2008, TBD 2010) bringing together scholars and practitioners from scientific, creative, and mystical disciplines to explore and share transformative paths leading to integration of mind, body and spirit. Lucumí, Vodun, Palo, and Candomblé religious expression in dance. Vinesett, AL; Whaley, RR; Woods-Giscombe, C; Dennis, P; Johnson, M; Li, Y; Mounzeo, P; Baegne, M; Wilson, KH, Modified African Ngoma Healing Ceremony for Stress Reduction: A Pilot Study., Journal of Alternative and Complementary Medicine (New York, N.Y.), vol. 23 no. 10 (October, 2017), pp. 800-804 [doi] [abs]. Vinesett, AL; Price, M; Wilson, KH, Therapeutic Potential of a Drum and Dance Ceremony Based on the African Ngoma Tradition., Journal of Alternative and Complementary Medicine (New York, N.Y.), vol. 21 no. 8 (August, 2015), pp. 460-465 [doi] [abs]. Vinesett, AL, First Person: Artists Talk About Their Art, edited by Dowell, FO, Dream/Girl Magazine, vol. 1 (February, 2014), pp. 9-10, Dream/Girl Magazine [abs]. Vinesett, AL, Motivating by Movement, Archive, Duke Magazine, vol. 90 no. 1 (January-February 2004) [html] [abs].